Development of High Frequency (HF) radar to measure the ocean's surface has allowed significant advancement since its inception in the 1950s. Essentially, an HF radar station transmits an electromagnetic wave of 6 to 50 MHz that is propagated as a ground wave along the sea surface, which due to its salinity is almost a perfect conductor at these wavelengths. The transmitted wave is scattered by the ocean surface, and the Doppler spectrum of scatter from ocean waves of half the transmitted wavelength (Bragg wave) are received by the HF radar station and provide the basis for determining ocean surface measurements (surface current, wave height, wind direction). The University of Miami Rosenstiel School of Marine and Atmospheric Sciences currently operates four WERA High Frequency radars in Key Largo (2 May 2004), Crandon Park on Key Biscayne (14 May 2004), Virginia Key (13 October 2008) and John U. Lloyd Park on Dania Beach (30 May 2008). The radars at Key Largo, Crandon Park and Dania Beach transmit at 16MHz (Virginia Key transmits at 12MHz) and provide measurement of currents on the ocean's surface over a large area of the ocean off Miami, FL. 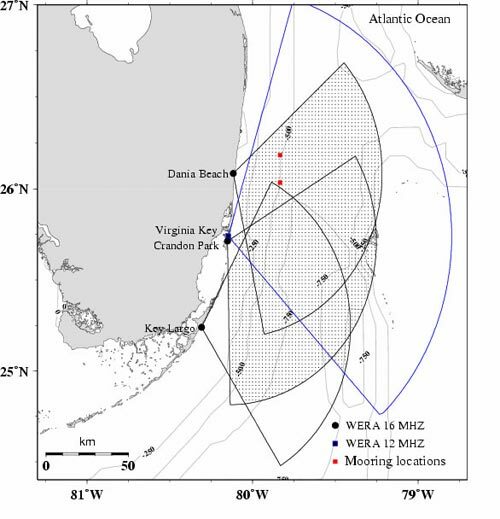 Caption: Current coverage of all four Rosenstiel School WERA sites extends across the East Florida Shelf, over the Atlantic basin. The WERA system transmits a frequency modulated continuous wave (FMCW) chirp, avoiding the 3 km blind range in front of the radar (Essen et al., 2000). The horizontal resolution of WERA is a function of the chirp characteristics. For a transmission frequency of 16 and 30 MHz, Bragg wavelengths are 9.4 and 5 m, respectively. The transmitter is arranged to encompass about a 60 deg swath. WERA also has the flexibility to be configured into a DF array (such as CODAR) where four antennae may be set up in a square, or a linear array can be set up consisting of 4n antennae or channels using BF techniques. According to representatives from the company, a long-range, high horizontal resolution version can be designed where the range would be O (100 km) and the horizontal resolution would be 600 to 750 m. This higher spatial resolution requires bandwidth of 200 to 250 KHz, and approval from the Federal Communication Center (FCC). Temporal sampling can be as low as a few minutes, since the system is FMCW, as opposed to a pulsed radar (i.e. OSCR) method. This sampling feature makes WERA particularly attractive in high current gradient regimes where time scales of surface current variability are less than an hour. Initially, a dual-station WERA system was deployed along the West Florida Shelf (WFS) starting on August 23, 2003 and ending on September 25, 2003 to sense the surface circulation over moored Acoustic Doppler Current Profilers (ADCPs). During this period, a 33-d nearly continuous time series of radial and vector surface currents were acquired at 30-min intervals. At a transmit frequency of 16.045 MHz, the HF radar system mapped coastal ocean currents over a 40 km 80 km domain at 2820 cells. Radar sites were located in Venice, FL adjacent to the City of Venice Sewage Treatment Facility (27 4.710 N, 82 27.050 W) and at an oceanfront site along Coquina Beach, FL (27 27.360 N, 82 41.70 W), equating to a baseline distance of 45 km (i.e. half the radar range). Each site consisted of a four-element transmit and a sixteen-element receiving array (spaced 9.34 m apart) oriented at angles of 251 T at Venice and 240 T at Coquina Beach. Cable calibrations were conducted at the beginning, during and at the end of the deployment to monitor any variations in signal amplitudes and phases. A total of 1628 snapshots of the vector surface currents were acquired with only 70 samples (4.3%) missing from the vector time series. Comparisons to subsurface measurements from two moored acoustic Doppler current profiles revealed RMS differences of 1 to 5 cm s-1 for both radial and Cartesian current components. Regression analyses indicated slopes close to unity with small biases between surface and subsurface measurements at 4-m depth in the east-west (u) and north-south (v) components, respectively. Vector correlation coefficients were 0.9 with complex phases of -3 and 5 at EC4 (20-m isobath) and NA2 (25-m isobath) moorings, respectively. Complex surface circulation patterns were observed that included tidal and wind-driven currents over the west Florida shelf. Tidal current amplitudes were 4 to 5 cm s-1 for the diurnal and semidiurnal constituents. Vertical structure of these tidal currents indicated that the semidiurnal components were predominantly barotropic whereas diurnal tidal currents had more of a baroclinic component. Tidal currents were removed from the observed current time series and were compared to the 10-m adjusted winds at a surface mooring. Based on these time series comparisons, regression slopes were 0.02 to 0.03 in the east-west and north-south directions, respectively. During Tropical Storm Henri's passage on 5 Sep 2003, cyclonically rotating surface winds forced surface velocities of more than 35 cm s-1 as Henri made landfall north of Tampa Bay. These results suggest that the WERA measured the surface velocity well under weak to tropical storm wind conditions, and provided UM researchers with evidence of WERA’s compatibility with future projects.